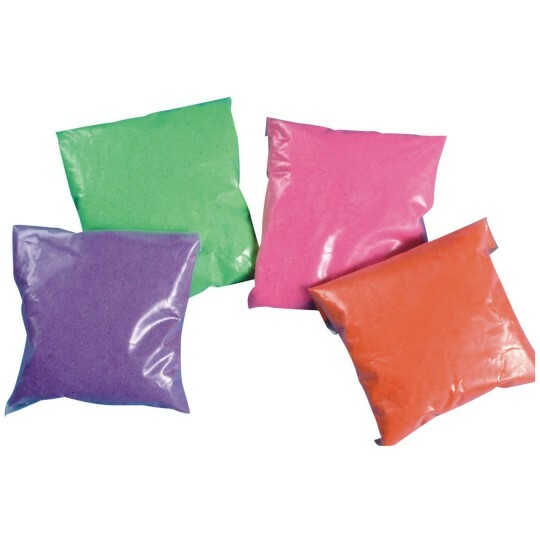 Our most vivid, glowing sand-art colors ever the brightest pink, purple, orange and light green in 1-lb. bags. Ideal for sand layering and sticky boards. Non-toxic. Pack of 4. Quality Sand AND Beautifully Vibrant Colors! Absolutely the most vibrant colored sand!! Stays where you pour it. Excellent quality and pricing! Colors are great but I wish these were offered in 2 lb bags. Only issue is I wish this came in a larger overpack. Its also more expensive that the 12 pack. Orange is the same shade as the 12 pack as well. I plan on using it for Inlay work. I will use this Fluorescent Sand in my Artwork Sculptures.